Monday-Friday 9:30 a.m. – 4:00 p.m.
Monday-Friday 8:30 a.m. – 4:00 p.m.
Monday-Friday 10:00 a.m. – 2:30 p.m.
Saturday 9:00 a.m. – 4:30 p.m.
Open only on day of event. Hours vary depending on event promoter. 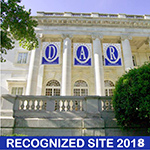 NSDAR buildings, including the library and museum, are closed to the public for a week during the NSDAR annual Continental Congress (dates vary annually in the end of June and beginning of July). Buildings closed Sundays and Federal holidays.